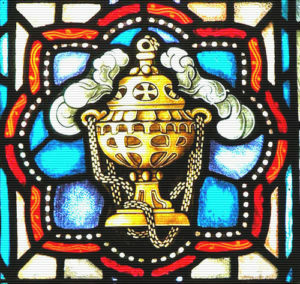 We typically use incense during the Holy Communion service on the first Sunday of each month and, generally speaking, for the important feasts of the year. Why do we do that? 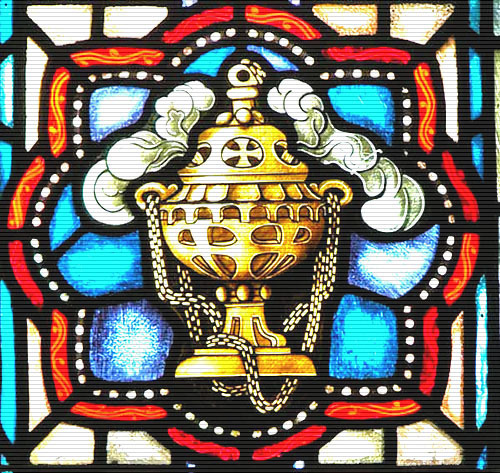 In this post, I want to look at the scriptural context for incense. Incense is first and foremost a symbol of and an adornment to our prayers. In the New Testament, we see from the Revelation of John a vision of God’s heavenly throne room in which the smoke of incense rises up along with the prayers of God’s people (Revelation 8:3-5). And in the Old Testament we see a similar image of prayer. “Let my prayer be set forth in thy sight as the incense,” Psalm 141 says, “and let the lifting up of my hands be an evening sacrifice.” We should remember, then, that our prayers rise up to God, and they are not lost. They are a sweet fragrance to our Father. And when we worship God and offer our prayers—either corporately or in private devotions—He is not far from us. Elsewhere in the New Testament, Paul writes that we as Christians are an aroma—a sweet fragrance—to God (2 Cor. 2:15). And in another place, Paul tells a church that their gifts and offerings to God are a “sweet smell” (Phil. 4:18). This is the language of sacrifice. We are called as Christians to present our prayers, gifts, and our very selves to God as a sacrifice of worship. This language of sacrifice should point us back to the forms of worship we find in the Old Testament. There we see that the burning of incense, like frankincense or some other spice, was a common feature of worship under the Old Covenant. The Lord instructed Moses in detailed ways concerning the burning of incense, which was burned in the tabernacle or in the temple on its own or sometimes with cereals or the flesh of animals. In the Gospel of Matthew, frankincense comes up again, but this time with the birth of Jesus Christ. The wise men from the east, when they arrive at the stable in Bethlehem, offer gifts to the young child—gold, frankincense, and myrrh (Matt. 2:11). Many commentators on this text have speculated over the meaning of these gifts, with significance attributed to the different offices of Christ. Frankincense, an item associated with services of sacrifice, would seem to symbolize the priestly vocation of Jesus. This may be overly speculative, but the point that is being made is most certainly correct. Jesus Christ, as both the priest and the sacrificial lamb, offered up himself once for all and did away with the old sacrificial system with a better covenant of grace. The prayers, gifts, and incense that we offer in Holy Communion services, then, are not sacrifices meant to placate God or cover our own sins. Rather they are offerings of thanksgiving and praise given freely in response to the good news—the gospel—that Jesus has already completed the once and final sacrifice. Incense should cause us to look back to the sacrificial system of the Old Covenant and how our Lord fulfilled all of its demands. But it should also encourage us to look forward to the presence of God, where our prayers in this life already ascend, but where we will soon appear face to face. Kyle Williams is a graduate student and a member of Trinity Church.